Little Giant Continuous Width Product Tables Infinitely Expand To Accommodate Assembly, Maintenance, Packaging Applications And More. 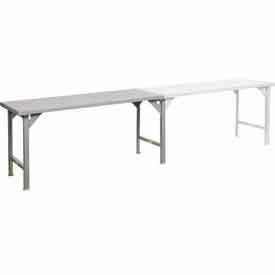 Little Giant Continuous Width Product Tables are made with angle iron legs and heavy gauge steel tops for lasting durability and rigid support to heavy loads up to 3000 lbs.. Multiple add-ons can be added to a single starter to build a production table to length needed for specific industrial or commercial tasks. Starters include 4 legs and a top; add-ons include 2 legs and a top. Legs and gussets bolt to top with included hardware for extra strength and stability. Overall height is 36". Top widths are 30x48", 30x60", 30x72", 36x48", 36x60" and 36x72". Ships flat. Gray powder coat finish.